Between the Place de la Concorde and the Madeleine at 3 rue Royale in the 8th arrondissement, you’ll find Maxim’s, that famous Parisian landmark which was completed for the 1900 World’s Fair. Maxim's began as a bistro in 1893 but it wasn’t long before it developed into one of the most popular restaurants in Paris. It was the place "to be seen". It has a long and rich history which includes a list of famous guests from Jean Cocteau to Brigitte Bardot (Hey -that rhymes)! I haven’t dined at Maxim’s so I can’t tell you what the food/service/pricing is like (although I have my suspicions $$$$), BUT if you decide to pass on dinner and the cabaret, you can still see Maxim's from the inside. Above the restaurant, Maxim’s has a wonderful museum, Maxim's Art Nouveau "Collection 1900", created by Pierre Cardin, the current owner. 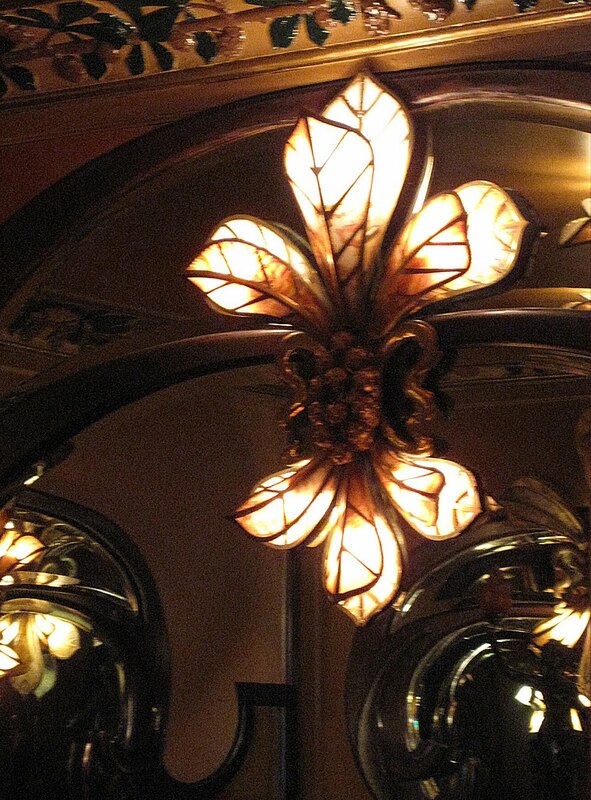 The interior is stunning with Tiffany and Gallé glass, period furniture and paintings. Temporary exhibitions are also featured. (When we were there, a collection of rare, decorated dinner menus was on display). 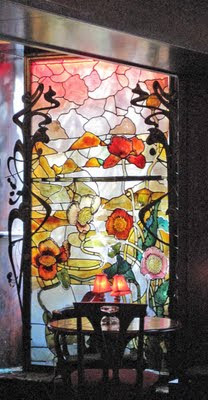 So, if you’re in the neighborhood and want to see an Art Nouveau setting that will take your breath away, stop in. In Woody Allen's latest film "Midnight In Paris", Clive Owen and Marion Cotillard are at Maxim’s when they meet Lautrec! Speaking of films, we can't forget "Gigi" for another peek at this landmark. I haven’t seen this film. Apparently it’s been made 3 times and is also running as a theatre production in Paris at La Comédie Saint-Michel until January 1, 2012. 'You may have read in travel folders that Paris is a city that never sleeps. unless you're working for the department of sanitation. If you want a nightcap at Maxim's, it's too late. It's been closed for hours. If you want to jump off the Eiffel Tower, it's too early. It won't be open for hours'.